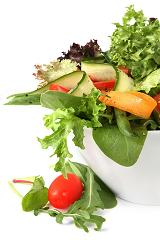 Wash the fresh spinach in a salad bowl, add halved cherry tomatoes and pieces of yellow and red bell peppers. Add some mackerel strips, or sardines, olive oil or better still 1 tbsp Udo’s Choice Ultimate Oil Blend Organic and sliced black olives. Mix these around and eat straight away.